High fashion with a laid back, durable style as unique as you, in a sustainable, naturally sourced, eco-friendly Deer Antler band. It is important to note the color and pattern variations are beautiful and limitless as both are very much influenced by the buck's location, diet, age and genetics; the ring you receive will be a bit different than the ring shown. The antler used is naturally shed and each ring is one-of-a-kind. Ring Armor protects antler from water, UV rays and the typical nicks and scratches occurring from everyday wear; it keeps the natural beauty of the antler while boosting its overall durability for everyday use. Choosing the right size for your custom ring is as important as the style. 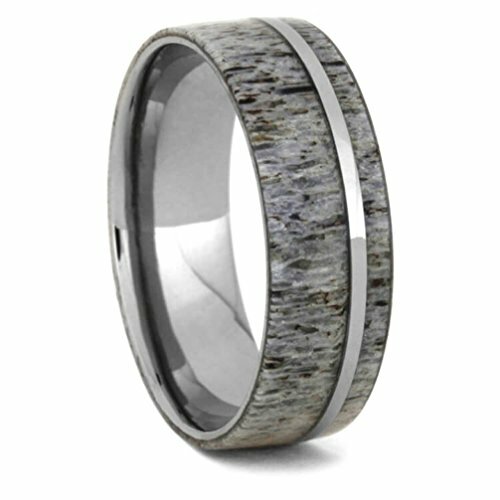 Titanium cannot be re-sized and the antler inlay goes all the way around the band with no joints. Part of the customization process for you is a purr-fect fit. Upon ordering your ring, a sizing ring is crafted for you in the width and size of the ring you ordered. It ships in 3 to 5 business days. Once you verify the size is exactly how you like it; the crafting of your hand-made ring is started.